5th sentence, 74th page: In order to brainstorm, I invited Sheyenne to lunch. Dan Shamble, Zombie P.I. 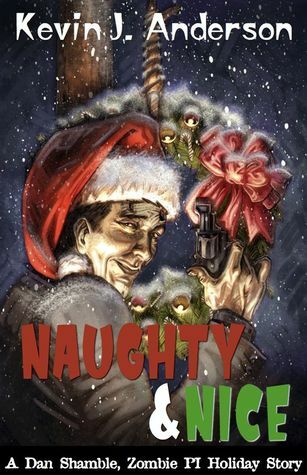 finds himself tackling a bizarre Christmas case when Santa Claus himself becomes a client, hiring Dan to recover some very precious stolen North Pole property. If you like werewolves, vampires, evil elves, zombies, as well as a lot of belly laughs, curl up with this story and some eggnog. I’m struggling to get into the Christmas spirit this year. So I thought that I would try and read some Christmas themed stories to get the festive feelings going… and it’s kind of working, but mostly it’s giving me that nice,happy, buzzy feeling that a good story gives me. And this was an amazing story to start the collection off with. It was funny, sassy and reminded me of the joy that Christmas time used to bring as a child (and I’m not talking about the presents). For me, Christmas has always been about the joys of family,friends and community. Although, as with any other kid, I’ve always thoroughly enjoyed present receiving (and giving), it’s been about the people that I’m around. So it’s always been a little annoying to be thrust into a world full of the commercialisation of Christmas. And how many people have bitched about that? Luckily, Anderson feels the same – this story is all about how bad the commercialisation really is. The comedic and entertaining way in which this was done worked nicely. This story by itself would have made me quite happy and entertained.But the fact that a zombie was the P.I. and his poltergeist girlfriend helped him out… that just made everything ten times better. It introduced a level of dark and urban fantasy to a Christmas tale that worked incredibly well for my happily crazy and convoluted brain.